GoPoint Technology creates award-winning connected vehicle solutions so you can stop worrying about your vehicle and start doing something about it—all with the power of your smartphone. GoPoint engaged Logic Solutions to develop a mobile app that works in tandem with their BT1 Bluetooth automotive diagnostic device. The BT1 easily plugs into your car’s computer and pairs to the users’ Apple device via Bluetooth. Mobile app that tracks membership and association perks and loyalty programs. Now when you see the dreaded “check engine” light, you can investigate the problem on your own, saving time and money. All you have to do is open your GoPoint app. The app provides you with diagnostic information to let you know whether the issue can be easily fixed, such as closing an open gas cap, or if you should take your vehicle to a mechanic. The app also allows you to clear warnings in your car by clicking the “I fixed it” button, which instructs the diagnostic tool to reset the check engine light. In addition to automotive diagnostics, the GoPoint BT1 provides you with National Transportation Safety Board (NTSB) technical services bulletins and recall notices pertinent to your vehicle. Logic programmed this pull feature using NTSB APIs. 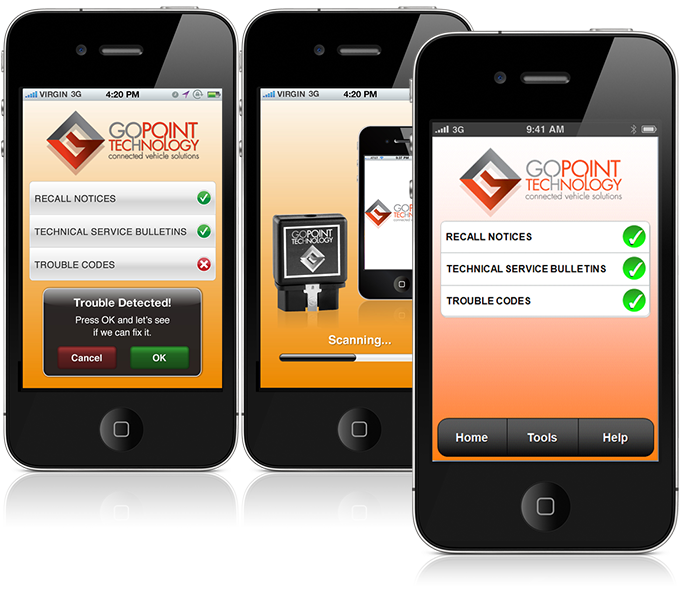 The GoPoint BT1 app is available on the App Store, with a planned Android launch expected in early 2012. The GoPoint BT1 accessory is available at RadioShack stores.